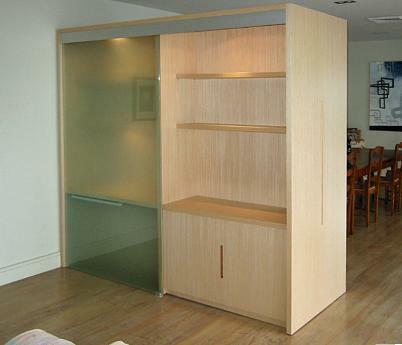 Ovod was commissioned to manufacture and install a unit to be used as a home office and central storage unit. The client's brief was to have an item of furniture that could be used as an office which, when not in use, would be concealed by a full length sandblasted sliding glass panel which would cover the desk section hiding the clients confidental documents. The other side of the unit acts as storage for the kitchen side of the room. Timber veneer from " New Age Veneer"
Sliding system from Hafele Australia.